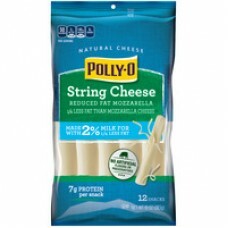 Polly-O 2% Milk String Cheese Reduced Fat Mozzarella. Natural cheese. 1/4 Less fat than mozzarella cheese. Made with 2% milk for 1/4 less fat. No artificial flavors or preservatives. 7g Protein per snack. Per stick: 60 Calories. 2.5g Sat fat, 13% DV. 160mg Sodium, 7% DV. 0g Sugars. Net Wt 10 oz (283 g). Only 5 ingredients in our ingredient line. Good source of calcium to build strong bones. Zero grams of sugar. Wholesome portable - Perfectly portioned. Contains 0g of lactose per serving. This product ... Mozzarella. Fat: 4g ... 6g. Despicable Me 3 is a trademark and copyright of Universal Studios. Licensed by Universal Studios. All rights reserved. Call: 1-800-847-1997. Visit us at: www.kraftheinzcompany.com, www.despicable.me. © Kraft Foods.